Canine Calming Yums are made with natural ingredients shown to help calm anxious, hyper or nervous dogs and puppies in a great tasting soft chew. Our new enhanced formulation includes a combination of calming enhancers, including passionflower, chamomile, L-Tryptophan, valerian root and melatonin. 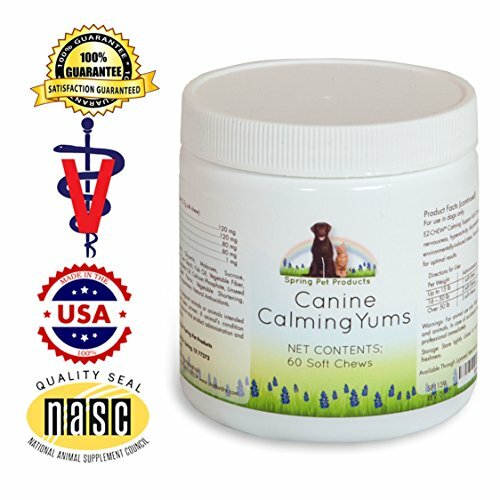 Spring Pet Calming Yums are a veterinary exclusive product that is manufactured in the United States to insure freshness, purity and quality ingredients and comes with a 100% customer satisfaction guarantee. Click The ADD TO CART Button at The Top of The Page and Buy Your Canine Calming Yums Right NOW! Natural ingredients L-tryptophan, Chamomile, Valerian Root and Melatonin helps to calm anxious, nervous or hyper dogs or puppies. Can be used to reduce the stress during thunderstorms or fireworks. Works best when combined with behaviour modification, desensitization and counter-conditioning. Helps to calm pet when traveling, crate training or taking trips to veterinarian.